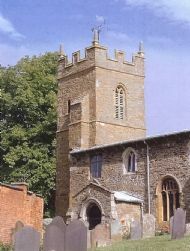 The Church of St. Denys, Cold Ashby is listed grade 2 and is a modest stone church set on high ground to the south of the present village centre. It has a square west tower added in the 15th century with embattled parapet and corner pinnacles. The existing building is reckoned to date from the 12th or 14th centuries and was restored in about 1840. The earliest mention of the Church comes in the reign of Stephen 1135 - 1154, when St Denys was given to Daventry Priory by Hugh Poer. The register of incumbents dates back to 1258, earlier names may occur in the register of Daventry Priory. The south porch is interesting and reputed to date from circa 1696. The vestry was added in 1881. The north door opening is probably 19th century as is the organ gallery. 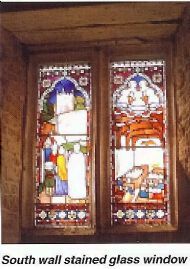 Stained glass is 19th and 20th century in a mixture of clear and coloured glass set within stone surrounds of various patterns from square headed timber to perpendicular style. Two of these are interesting in that they depict views of the church itself. Tudor rose carvings at the corners of the doorway proclaim its age (15th century) and the old door still hangs where the carpenters hung it over 500 years ago. Opposite is the door to the vestry, incorporating a Saxon arch in the doorway, and above is a Royal Coat of Arms of George 3rd dated 1778. This was cleaned and restored by Mrs Avis Smigielski in 1970 when she lived in the Old Vicarage. A faculty was issued in 1789 to erect the gallery which is usually used to house musicians to accompany services. It still functions in that way today as it holds the small pipe organ built in 1840 and presented by Reverend William Mousely and finally installed in 1873 by Reverend Gregory Bateman. Both of these men enhanced the church with additional memorial tablets and windows. Under the gallery is a perpendicular octagonal font on a panelled stem with fleurons to the underside of the bowl - 15th century. This area has always been designated as the Children's Corner. There is a quarry-tiled floor in a mixture of plain red, black and buff tiles and pitch pine fittings. 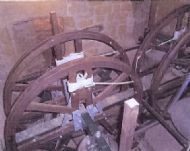 The ring of four bells was augmented to six in 2002 when the tower was restored and the clock converted to electric wind. The additional bells were gifts of Billy Lee and Malcombe and Dawn Jennifer Grant-Innes. The bells were all rehung with new fittings by Eayre and Smith. One of the bells is dated 1317 and this is reckoned to be the oldest bell in the world currently hung for change ringing. Unfortunately there is no local band of ringers at present. In the body of the church the main things to notice are the windows, mostly of relatively recent glass. Of particular interest is the one in the south wall by the pulpit. This depicts the interior and exterior of the church in Victorian times with Gregory Bateman as vicar: old-fashioned high pews, plaster walls and plain mediaeval east window. 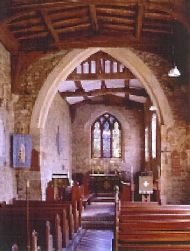 The pine pews, now present, are early 20th century additions and the walls and roof have been restored to original stone and timbers exposed to view in recent times (major work being carried out in 1991). In the pews are embroidered kneelers or hassocks. These are a memorial to Joan Bott, a delightful and very special lady, mother of nine, who lived life to the full from 1919 to 2000. She enjoyed her Christian faith, working hard in all sorts of ways for the community of Cold Ashby. The first 40 kneelers were worked by family and friends as a millennium project in her name, hence the figure 2000 in the centre; a further 40 have been completed by parishioners to remember other dear ones. Two steps lead up to the chancel where there is a small head carved in the wall on the left hand side - no names - no records. Above the altar is the glory of the east window in the 20th century multicoloured stained glass. The letters IHS always arouse interest - they stand for Iesu Hominum Salvator (Jesus, Saviour of Mankind). When the new cathedral was dedicated in Coventry in the 1960s Sir Basil Spence, the architect, acknowledged that his inspiration came from many different places, but chiefly from visiting local churches in a widespread area of the Midlands. We like to think that the windows in Coventry of coloured glass representing the ages of mankind - green for youth, red for adulthood etc. - owe their origin to this humble example. On the south wall is a scratch dial between the two windows which could well date back to the 13th century. The sundial on this same wall is dated 1703. The churchyard has been closed for new burials since 1878. (Order in Council 1884). A new cemetery was opened in 1879 and the first person to be buried there was Emily Bateman, wife of the Reverend Bateman. The lych gate, the portal to the dead, was erected by the Reverend Gregory Bateman in 1883. It is built of fine white and red Ancaster stone. It is approached from the road by three steps above which is a massive arch, moulded and supported by columns and carved capitals inscribe (Death is the gate of life". 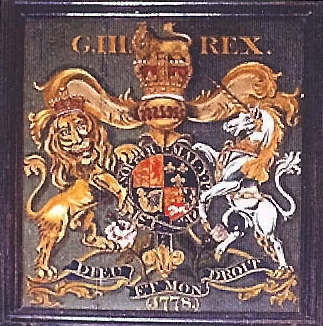 In the sandrel of the gable is marble panel bearing the coat of arms of the donor and surmounted by an elaborate cross, specially adapted from the beautiful north porch of Westminster Abbey. Seventy tons of stone were used in the construction, carried out by Allsop and Monk of Market Harborough at a cost of £400. It was opened on 23rd October 1883. Total restoration was undertaken in the year 2000 and the churchyard wall was rebuilt, following partial collapse, in 2001 with a properly designed concrete wall faced with stonework to give the same finish as previously. 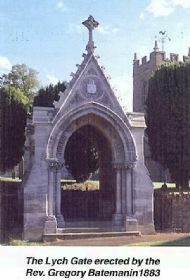 The lych gate is of limestone ashlar in High Victorian style and is separately listed grade 2. The churchyard is bounded on the south by the grounds of the Hall from which it is separated by a high brick wall belonging to the Hall. On the remaining sides it is bounded by the public road, the surface of which is at a somewhat lower level than its adjacencies on both sides. The houses on one side stand on top of embankments or retaining walls; the churchyard on the other side stands behind a retaining wall of similar height. An archaeological investigation carried out during the work discovered nothing of note. The Parish Council voluntarily contracts for the mowing of the grass and provides a grant to maintain the flower beds. The current service pattern provides two services per month on the first and third Sundays. Both are Prayer Book said communions with a short sermon on the first Sunday. There are special services at the main festivals. The churchwarden is Deborah Sampson. Her contact details can be found here. The whole of the PCC shares the work and everything gets done in good order. The PCC is very strong in fund raising, and the fabric fund continues to grow. The Open Gardens weekend in aid of the church is usually held on a weekend in early August. The Harvest Supper and sale of produce is held at the Cold Ashby Golf Club each year in October.